Great writing provokes arguments decades after it first appeared, which we can see in David Roderick's poem "Thoreau's Beans". We witness someone realizing that work is, after all, merely work.The way this poem proceeds is rapid and sharp, like the shovel or the hoe digging at a hard earth, and I do like the manner in which the clauses are stacked on one another, like so many books or dishes neatly arranged but still askew by seismic shifts or human vanity. The shifts here are vanity, it seem. David Roderick ‘s character, taken with a literary explication on the rural life and the time a communing with the earth allows one to think, contemplate, regard the larger things in life, i.e. , to think, allows him , though , to think about how hard this life is. You can sense the assumptions crumbling as the real facts of farm life take root. Please forgive the obvious word play. 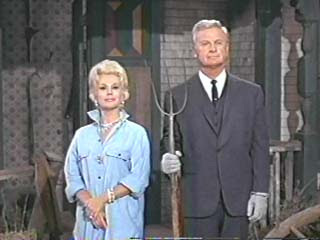 A television analogy might seem appropriate, but I think there’s a place for it here, in the sublimely subversive situation comedy Green Acres, wherein a park avenue lawyer named Oliver Douglas abandons the skyscrapers and big money for a rural life on a run down farm. Everyone around him realizes that the farm he bought is an arid , dilapidated mess, and who are, in fact, more aware of the world as it is than the would be gentleman farmer, who , tilling the field and repairing machinery in pleated pants, Brooks Brothers shirt tie and vest, refuses to, or cannot realize that he’s deluded . The source of the comedy is obvious, and effective. Roderick’s character, though, seems like an Oliver Douglas who gets it, that is, gets the moment of clarity that he is neither engaged in an applied philosophical inquiry nor ascending to a higher intellectual/spiritual rigor, but rather in an occupation that is a living, not a lifestyle. Fine, subtle and resonant as Thoreau’s writings are, as central to the American Canon as they have been, they are rather useless as guides to being an effective farmer. Perseverance is the quality city folk forget to talk about when waxing about the connection between the earth and a man who gets his hands deep into the dirt to bring life into the light. What registers with our protagonist, I read, is the meaning of this activity isn’t about having an active in the seasonal life cycle, but rather bear survival. One does this because they have to, not because they are intrigued by the exotica of other ways of life outside a cozy urban context.